There are a lot of great folks in the Portland beer community. I've always been amazed me that these people, who compete for the hearts, minds and taste buds of the same customers, have developed a friendly camaraderie that seems to transcend business competition. One of the best people around is Lompoc's Dave Fleming. 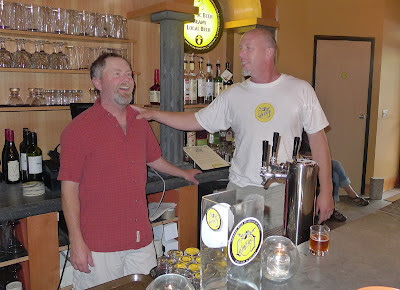 I first met Dave at a Lompoc tasting last fall, and I've since run into him quite a few times at the Fifth Quadrant/Sidebar and around town. He's always happy to share what's going on with the beers and the brewery. And he doesn't mind taking a little ribbing over the exploits of the Red Sox, Celtics or Patriots. Chowda is just one of his nicknames, based on his Northeast origins, I assume..
After three years as the head brewer at Lompoc, Dave is leaving the building. It's not so surprising if you look at his bulging travel docier. Dave has bounced around the brewery landscape extensively since 1992, when he started at Bridgeport. He's had portages at the Lucky Lab, Rock Bottom (Bellevue), Caldera (Ashland), Bend Brewing, McMenamin's, Three Creeks and, finally, Lompoc. Some might call it wanderlust. It turns out Chowda Dave isn't going far this time. He's going to work for Willamette Valley Hops, one of an increasing number of growers that produce designer-quality hops. This ought to be a nice arrangement for Dave and for Willamette Valley. They have a great product; Dave has the contacts and persona to make sales happen. Perfect. They are giving Dave a farewell soiree this Friday, July 13, at the Sidebar on North Williams. Stop by between 4 and 10 p.m. to toast Dave one more time. Everyone is welcome. He truly is one of the good guys. Come by and wish him well.